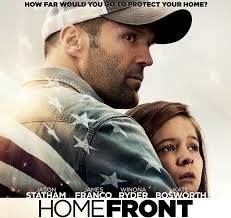 SYNOPSIS: HOMEFRONT is an action movie about a widowed ex-DEA agent who retires to a small town for the sake of his 10-year-old daughter. The only problem is he picked the wrong town. This edge of your seat action thriller features an exciting ensemble cast. Jason Statham and James Franco face off in a quiet southern town as Winona Ryder and Kate Bosworth become entangled in a fight that consumes everyone. HOMEFRONT will be the MUST-SEE action thriller this Thanksgiving!